For many people, May is their preferred time to travel. Avoiding the heat of the summer and the unpredictability of early spring, May has the glorious days with the still cool nights that make spending time outside refreshing without being draining. If you have the opportunity to travel during May, be sure to do so, as it offers a different take on sightseeing that only comes when not surrounded by the hordes of peak season. To top it all off, May has some great offerings for the food lovers out there – so pay attention! Yet still, areas can be quite busy during may during a local festival, but this is the kind of busy you definitely want to take part in. With so many celebrations of culture around the world taking place, it may be difficult to choose just one to attend. Jazz lovers would be wise to take a trip to the west African country of Senegal to the Saint Louis Jazz Festival in May, while those on Australia’s Sunshine Coast should head up to beautiful Noosa to take part in the Noosa International Food and Wine Festival. You really can’t go wrong when you attend a local festival as the spirit and culture of the locals makes you feel less a visitor and more a citizen of the world. 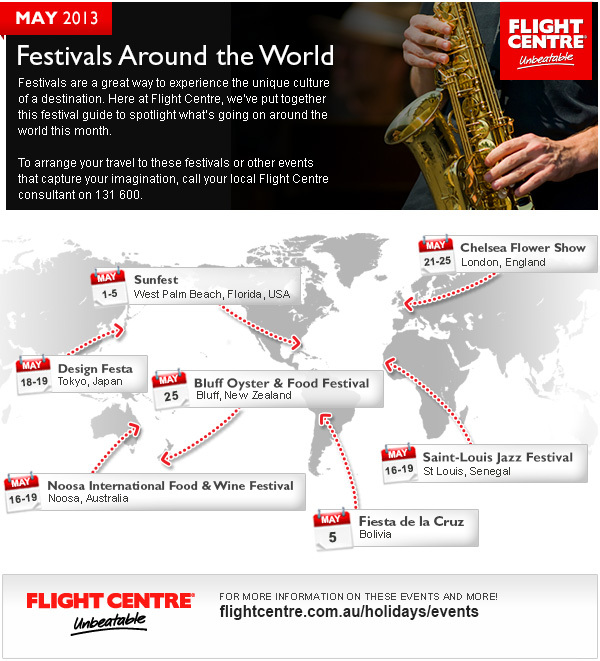 For more ideas on travel during May and taking part in world festivals, check out the infographic Flight Centre has assembled. It’s a great place to start to get ideas on inspiring your travel, things to do if you’re already in the area or suggestions for next year. With so many great festivals lined up in May, you’ll have no problem finding the experience that’s right for you.